The recipe I used for my Chocolate Chip Cookie Pie? Like I mentioned in that post, I used the leftover batter at the end to make about a dozen chocolate chip cookies. They were soft, moist, and chewy — just the way homemade chocolate chip cookies should be! There’s nothing like freshly homemade chocolate chip cookies made from scratch right out of the oven. I also tend to find that I don’t have the best luck use store-bought dough: they tend to burn at the bottom really quickly while the middle of the cookie hasn’t set… and it’s just plain annoying. These cookies, I found, to be perfect! For quantity purposes, I’ve halved my Chocolate Chip Cookie Pie recipe, but you can use the original quantities if you are making a huge batch of cookies. In a bowl, add your butter along with both type of the sugars and then beat on low to medium speed until the mixture is light and fluffy. Next: add in the salt, vanilla, and egg. Beat until everything is well mixed together. Add in your flour and baking soda and mix to combine everything. Lastly, stir in the chocolate chips. These look yummy. I am always keeping my eyes open for choc chip cookie recipes. You know you have to find the one that turns out the best for you in your oven with your bakeware. I use air bake sheets so no burning but time to cook can be a challenge. Thanks so much for posting. Visiting from House on the Way. Blessings! Thanks Wanda! 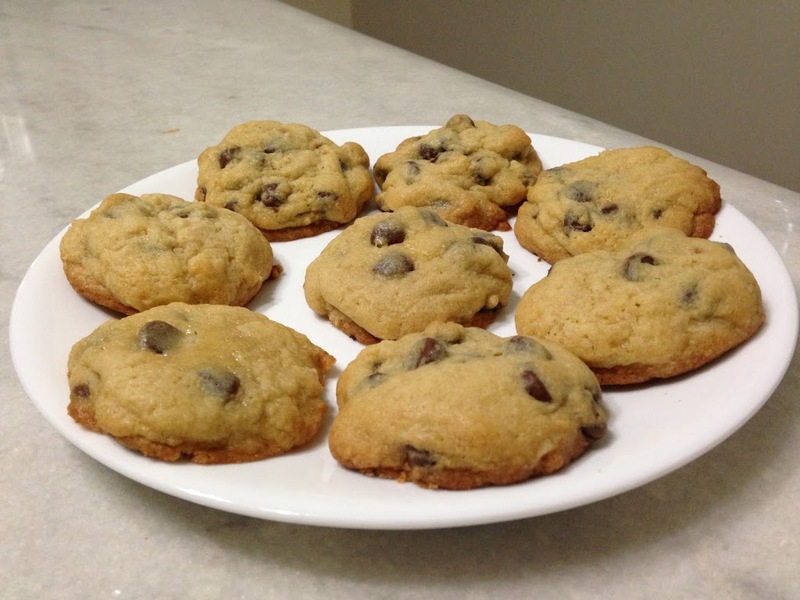 I agree, chocolate chip cookie recipes are one of those things you have to try many different versions before finding &quot;the one&quot; that works for your oven and bakeware.<br /><br />I&#39;ll have to look into air bake sheets, thanks for the suggestion! I love love love Chocolate Chip Cookies! Thanks for Sharing at Show Me Your Plaid Monday&#39;s! Pinned ! The cookies look so soft and chewy 🙂 Thank you for sharing at our ALL MY BLOGGY FRIENDS party !